These triple decker hammocks are perfect for nosey rats, who can snuggle in them, or lounge on top of them! Each hammock is made of three hammock layers, and is suspended using metal eyelets. All hammock tiers are made of a layer of cotton and a layer of fleece. 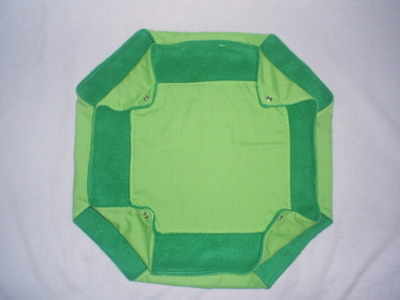 This triple decker hammock is made of plain lime green cotton and forest green fleece.